05.07.2016. The Friedhelm Loh Group has now welcomed its new students on dual work/study programmes during a tour of a special kind. 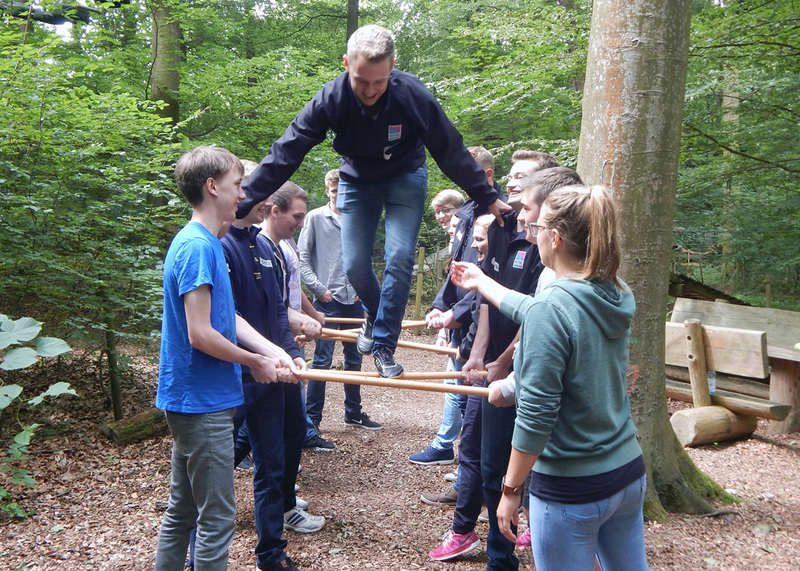 Seventeen young people quickly learned to pull together and achieve their own and common goals at the Wetzlar climbing park. To this end, they had to overcome their own limits – a good foundation for their studies of business administration, engineering or industrial engineering. Change starts outside the comfort zone. Those who look boldly beyond the horizon and beyond their borders will evolve. 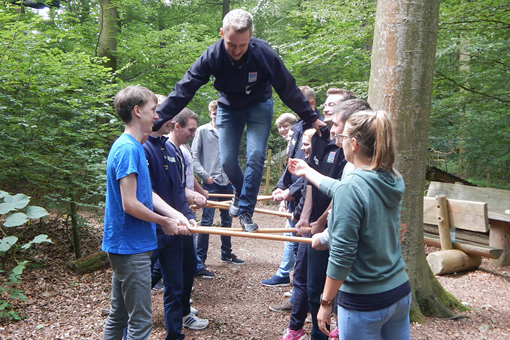 However, at the Wetzlar climbing park, the 17 new students of the Friedhelm Loh Group learned the hard way just where the journey beyond known limits will lead to, and how far one should actually go. During team-building, they went over hill and dale, up to the tree-tops, and then back to the ground of hard facts. The newcomers were quickly able to form an experienced team that learned to reflect on risks, make strategic decisions and share opportuni-ties as well as successes in a variety of exercises. Every one of them took one thing back home: Those who dare to do something new, will win – and lay the foundation for individual and common success. Whether they are studying mechanical engineering, SME management, or refrigeration and climate control technology on the StudiumPlus course at the University of Applied Sciences of Central Hesse (THM) in coopera-tion with the Friedhelm Loh Group, the new students are pursuing both their professional and academic interests. Together with the THM, the family-run company is offering nine bachelor’s degree programmes. During term-time, the students swot up for the university, while during the holidays they learn and work in the company. They pursue their own projects and take part in teams, learn from their colleagues or go to an international subsidiary. Not only students from Germany can work and learn internationally in the Friedhelm Loh Group. Students from abroad are drawn to the world leader in enclosure and system technology in Central Hesse. For instance, the Polish exchange student Piotr Guzik completed a three-month internship at Rittal in Herborn last year on the “European Industrial Experience Mittelhessen” (EIEM) programme. This year, two students have come to Herborn from Poland and Kenya to get a taste of Rittal’s Research and Development department, which shows that people in Germany and abroad are receptive about this joined initiative of various Friedhelm Loh Group companies and the THM. On this course, students will learn how to evaluate new technologies within the shortest possible time and to put this knowledge into practice within the company as needed. They assess the influence of digitalisation on business processes and implement software systems into existing systems. The importance of data in the industry is increasing continually, Mrs. Wojtynowski-Scharf added. This new field now needs new experts – ones who can look beyond the industry’s horizons. Image: It is easier to dare to do something in a team. 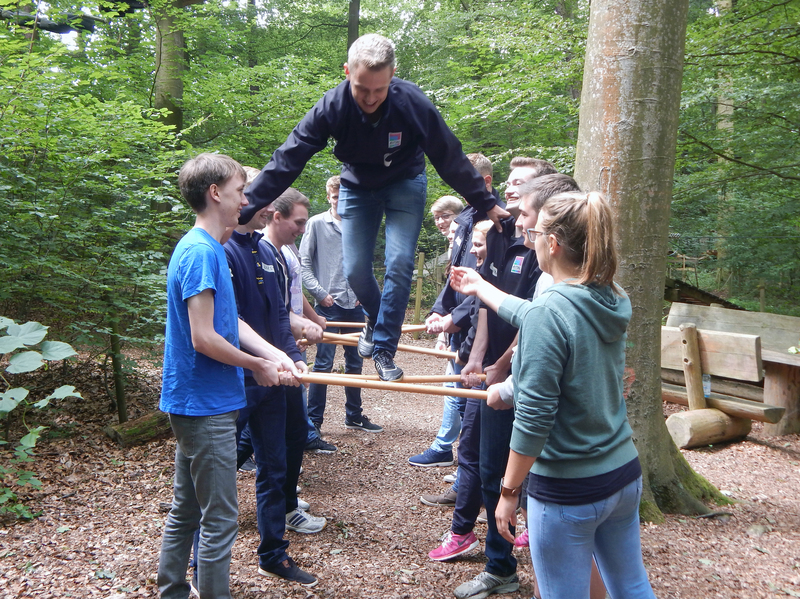 The 17 new students of the Friedhelm Loh Group learned this, as well as about further success factors in the office or at school during teambuilding exercises at the Wetzlar climbing park. May be reproduced free of charge. Please name Rittal GmbH & Co. KG as the source.